A new analysis of recently-released Census data on women-owned enterprises in the United States finds that the growth in the number of women-owned firms continues at rates exceeding the national average, and that growth in revenue and employment keeps up the pace with all firms, but only until women-owned firms reach the 100-employee level or the $1 million revenue marks. Women-owned firms are now estimated to number just over 8.1 million, generating nearly $1.3 trillion in revenues and employing 7.7 million workers. The new report, The American Express OPEN State of Women-Owned Businesses Report: A Summary of Important Trends, 1997-2011, also provides estimates of the number and economic contributions of women-owned firms by industry, by state, and by revenue and employment class of firm. Womenable conducted the analysis, basing the 2011 estimates on an analysis of the 1997, 2002, and 2007 Census data, the latter having just been released in December 2010. Learn more about and download the 53-page report free at OPENforum.com.women and read the full study news release here. The states with the fastest growth in the number of women-owned firms between 1997 and 2011 are Georgia, Nevada, Mississippi, Florida, and North Carolina; while the states with the lowest rate of increase in the number of women-owned firms are Alaska, West Virginia, Iowa, Indiana, and Vermont. We’ve all heard the finding that “the number of women-owned firms is growing at twice the national average.” This new analysis shows that the rate of increase in the number of women-owned firms still tops the national average, but the ratio is now 1.5:1 – a 50% increase in the number of women-owned firms between 1997 and 2011 compared to 34% among all U.S. firms. We also know that growth in revenue and employment in women-owned firms has always lagged the national average overall, but a more in-depth analysis of growth by business size shows that – in actuality – women-owned firms keep up the pace with the revenue and employment growth of all U.S. firms, but only until a certain point. 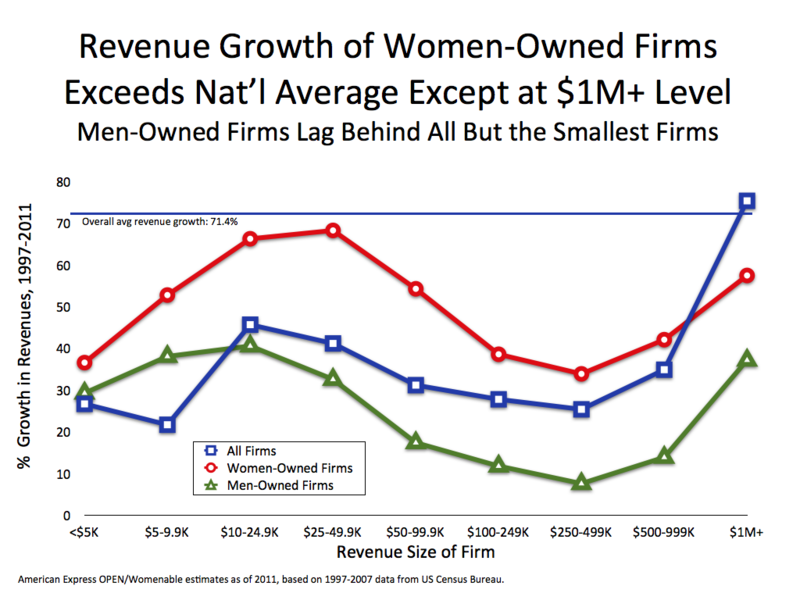 With respect to revenue growth, women-owned firms match the revenue growth of all firms on a percentage basis all along the business size spectrum – until the million-dollar revenue mark. With respect to employment, again women-owned firms match percent growth along most of the business size spectrum – but falter after the 100-employee threshold is crossed. 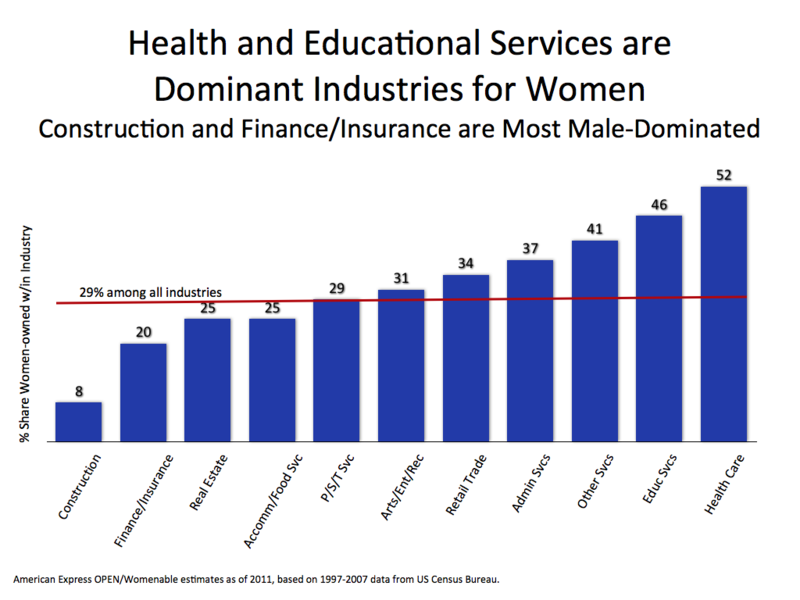 This new analysis should dispel the notion that women-owned firms start small and stay that way. In point of fact, they are progressing along the growth spectrum at a pace matching all firms – and even exceeding that of men-owned firms – and start to lag only as they approach the upper echelons of business achievement. More work needs to be done to better understand what barriers are standing in their way, and how they may be overcome. This new report provides a much deeper understanding of growth and invaluable signposts to help guide the way. This entry was posted in business, statistics, women business owners, women's business development, women's business ownership, women's enterprise development, women's business research studies, women-owned business and tagged American Express OPEN, business, statistics, US Census Bureau, women's business development, women's enterprise, women-owned business, Womenable by womenable. Bookmark the permalink.